What’s the difference between a novelty watch and a classic timepiece? Certainly, using extreme examples, we can understand the difference between a watch that includes a miniature poker game and a sober-sided perpetual calendar by Patek Philippe. But, is it possible to make a watch providing a novel and entertaining display of time that is wearable in a variety of settings and will be respected years from now? I believe that I own such a piece: the Ludovic Ballouard Upside Down. In my friend Terry’s collecting taxonomy, this was definitely a “patronage” purchase for me, intended to express support for Ballouard and his tremendous inventiveness while grabbing a bit of the resulting product to have for my own. A good friend of mine was one of Ludovic’s very early patrons and a subscriber to the very first “subscription” series of the Upside Down. This was back in 2009, just after Ballouard had departed F.P. Journe to start up his own operation, after three years building the legendary Journe Sonnerie Souveraine. Seeing my pal’s watch in the metal and learning more about Ballouard had me interested, but I wasn’t fully ready quite yet. In each of the subsequent Januaries, our collector group visited with Ballouard during SIHH week at his customary haunt at the New Midi hotel in Geneva. When I saw the platinum Upside Down with the blue dial during one of these visits, I knew that at some point I would have to have one. In 2013, Harry Winston announced the Opus XIII (see The Harry Winston Opus Series: A Complete Overview from Opus 1 Through Opus 13), a mind-blowing jumping-time watch developed in collaboration with Ballouard. But somehow, things with the project went wrong and Ballouard found himself embroiled in a dispute with Harry Winston’s new Swatch Group owners. While I wasn’t privy to all of the details, my strong instinct was to support my independent watchmaker friend during what I knew was a challenging time for him. I’ll start with the obvious: the movement and its complication are fantastically inventive, beautifully executed, and quite robust. In the photo below, you can see the movement side of the Upside Down, with the most obvious feature being the set of 12 Maltese cross mechanisms linking to the small hour indicators inserted into the dial. If you look carefully, you can see the two small fingers engaging the slots on the 10 o’clock cross (just above the “O” in “Ludovic”) and one finger on the inner edge of the 9 and 11 crosses, ready for the mechanism at the center to do its magic when 11 o’clock arrives. Above, you can see the snail cam that rotates once each hour, followed by the pointed end of the finger at top left that in turn is held tight by the spring at bottom center. As shown in the time-lapse video below, when the points of the cam and finger cross, the finger snaps the ridged circular ring at the edge by one notch, in turn actuating the jumping hour indication. The result of all of this is that when seen from the dial side, the current hour indicator is right side up and displays a small dot to catch the eye, while all of the other hour indicators are, not surprisingly, upside down. I was a bit concerned that it might be a bit difficult to read the time, but in practice the dot works, your eye seeks out the “right side up” number, and I, at least, generally have a good enough sense of the time of day that I’m not searching at 5:00 when the time is around 11:00. If you’re looking at the above photo – or the one below – on a display of any size, you’ll also see something else: the surface of the dial itself is captivating to the eye, with thousands of tiny sparkles on the blue-coated titanium surface catching the light. The attractive visuals don’t stop there, either. A tour around the exterior reveals smooth, convex flanks reflecting the viewer’s image and surroundings; as you might expect, in the reflected view, all is seen upside down. Even something as utilitarian as the crown is hand-engraved and made in platinum rather than the white gold used by many others on platinum-encased pieces; it is surrounded by flowingly shaped crown guards that are so subtle you hardly notice them. Cinching the watch to your wrist is a treat, too, as it provides a chance to check out the unique B-shaped buckle (again, in platinum). And while you’re at it, a glance at the side of the buckle reveals another hand-engraved signature. The last stop on the engraving tour is the rear of the case, where the model designator, serial number, and Ballouard’s name have been hand-carved into the metal. 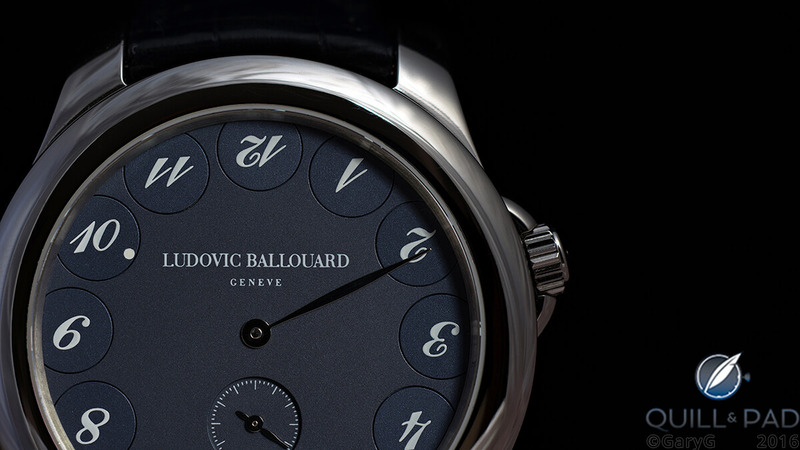 I also love the quirky nature of some of the choices Ballouard made, both with the watch and its presentation. For instance, this is one watch that has no presentation box! Instead, it comes packaged in a signed wallet made of the same material as the watchstrap. To me, it’s consistent with Ludovic’s style, and it’s also one less bulky box to seal up and put in storage. Finally, this is just a darn good-looking watch, and for me a versatile one as well. It’s almost a cliché these days to claim that a dressy watch can be worn with jeans, but it’s really the case for the Upside Down in this color combination. It’s similarly at home in the boardroom or with clients, as it doesn’t shout, “look at me” but instead projects a dignified presence. At 41 mm in diameter and 11 mm in height, with a pronounced curve to the lugs, it also sits very comfortably on the wrist. This watch is so attractive, versatile, and wearable that it is on my “cannot sell” list: Mrs. GaryG has declared this one to be half hers, and Ludovic was kind enough to fit a replacement strap of just the right length so that both she and I can wear it. The movement snaps the discs for the current and coming hours exactly when the minute hand is at 12, but the jump is not synchronized with the second hand. I do realize that doing so would have required an additional mechanism, and likely would have jeopardized the robustness of the movement, but I can wish, can’t I? Speaking of the “jumps,” I suppose that it’s a natural result of the snapping finger and crosses that some lubricant is inevitably sprayed across the surfaces of the movement. The macro lens is an unforgiving mistress, though, and at extreme magnification the view is, as Mom would have said, a bit schmutzig. If I’m not mistaken, there isn’t anti-reflective treatment on the exterior of the crystals. This made shooting this watch harder than you might guess! For more information, please visit www.ballouard.com. * This article was first published on October 10, 2016 at Why I Bought It: Ludovic Ballouard Upside Down. The beautifully understated design aspects of the watch make this a classic regardless of the orientation of the numbers. My initial instinct was to dismiss this watch because of the mind teasing upside down numbers. However once acclimated, one cannot deny the overall beauty. Thanks and enjoy! Thanks for commenting! Once I spent a few minutes getting used to the display of time, it became very natural for me. I have been enjoying it over the past couple of years, and my wife wears it from time to time as well!